Some friends in my Twitter stream (Noemi, -R-, Elisabeth, Jonna, Erin, Kelly) were complaining about the price of milk today. Noemi said she's paying $7/gallon, and I was appalled at the cost of milk in southern California. Appalled! She said it was for organic, growth-hormone-free milk, which made it a bit better, but I was still very confident that milk is far cheaper here. "I can get store-brand organic milk, and I bet it's only $3ish per half gallon," I said. And then I promised to check at the grocery store today and report back. I am horrifically bad at grocery shopping. I can't remember how much ANYTHING costs, and I often forget to compare prices based on unit cost. For example, milk. I thought $7/gallon was outrageous, but was apparently fine with $3/half gallon even though most basic arithmetic reveals that $3/half gallon is only $1 less than $7/gallon. And upon further investigation at the grocery store, I found out I was half right. Horizon Organic Milk is $5.98/gallon, or $3/half gallon, just like I thought the store brand was. But here's the thing: the store brand is is $6.39/gallon. And when I have been buying organic milk, I've been buying the store brand based on the assumption that it is cheaper! I never checked! I hate it when I am an idiot. But I actually pay way more for milk than that because I have it delivered from a local farm so that I won't have to carry it home, and so that I'm buying local, which I like. We get it in returnable glass quarts because it pleases me to feel smug and earth-friendly-like. However, this conversation has caused me to do some math, and it turns out I am paying organic-milk prices for non-organic milk. The farm does offer organic milk for delivery, but not in glass quarts. So I might rethink the whole earth-friendly thing. I learned one final interesting tidbit: Several of my friends can only get hormone-free milk in its organic form; if they don't want milk from growth-hormone-treated cows, they have to buy organic. I, on the other hand, was unable to find any milk in the store at all that did not claim to be growth-hormone-free. This was true even of the store-brand regular milk, at $2.99/gal. So here are my findings. All prices are the cheapest per/gallon rates I could find; regular milk comes in gallons so that's obviously cheaper per gallon than the same milk in quarts, but organic milk only comes in half gallons. *Plus delivery which depends on the order total. For me, delivery is $4.25 for 6 quarts of milk, 1 quart of cream. So it looks like I'm paying $0.42/gal to save the earth with reusable glass bottles. I order 1.5 gallons a week, so that's a total of $0.63 extra. That's not too terrible, I guess. I'm also spending quite a bit more to have local milk, but buying local milk in reusable bottles is worth something to me. However. I think we are going to have to stop having the milk delivered. I'm spending $150/year on milk delivery charges. That is kind of a lot, especially given that Andrew pretty much drives by the farm store on his way home from work. Ah, well, milk delivery was nice while it lasted. Thank you guys for all your sympathy about my poor angry eyes of the past week. It really does help me feel better if people feel sorry for me in my pitiful state. The new eye drops seem to be doing their job; my eyes are a million times better. They're still a little red and itchy, but nothing compared to what they were. And I did call the ophthalmologist to confirm that it was OK to still have itchy eyes after four days on the antibiotic, because I am done with messing around with the wrong prescription, thank you. 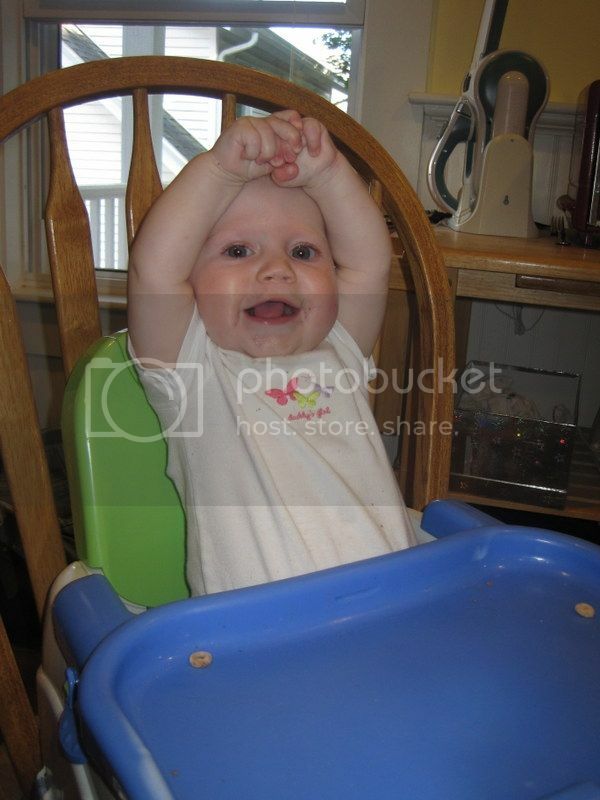 Ann Marie learned how to play, "How big is Ann Marie?" this week*, and I am so happy about it. 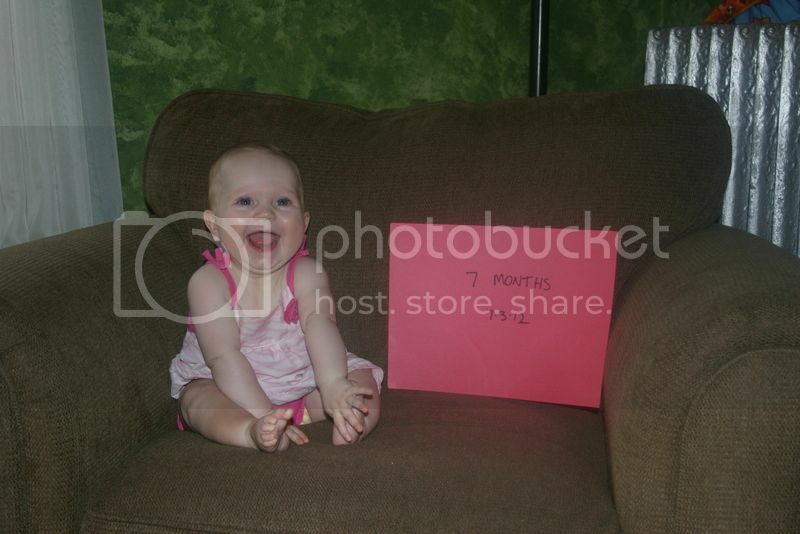 She also turned seven months old last week. She might end up being the only kid to get all twelve monthly shots, but we shouldn't count our chickens as there are still five months to go. For those of you not following me on Twitter, I have been fighting off an eye infection for the past five days. And by “fighting off” I actually mean “living with,” because, as it turns out, I have been fighting nothing. My eyes started bothering me on July 4. I thought it was just allergies, but then I woke up on July 5 with what appeared to be a case of conjunctivitis. I had never actually had conjunctivitis before, but I have been NEAR cases of conjunctivitis, so I am familiar with the symptoms. I high-tailed it to the doctor and got a prescription for tobramycin drops. They didn’t work. I got a second prescription for erythromycin ointment. Not only did that not work, but it also tickled my already-itching eyes while it was in, as a kind of ironic slap in the face. Or eye, I guess. An ironic slap in the eye. So today, five days after this all began, I got myself an appointment with an actual ophthalmologist. The earliest appointment I could get was 4:00. Meanwhile, today was the first day of Jack’s week-long Lego camp. It runs from 12:00-2:30 in a town about thirty-five minutes northeast of here. I spent the morning waiting for calls back from various doctors’ offices and trying to prepare to get everyone to leave at a moment’s notice, with the possibility of being gone for lunch. It was while I was making sandwiches that I learned my appointment would be at 4:00 – wait, unless, could I be there in thirty minutes? I stood there, holding a knife smeared with jelly, while a pajama-ed baby sat at my feet and two kids who had not been to the bathroom in a while sat in the living room with no shoes on and said, “No. I cannot possibly be there in thirty minutes.” So 4:00 it was! But THAT meant that instead of being gone for lunch, I would be arriving home with no time to make dinner. It was 10:00. We had to be pulling out of the driveway at 11:25 to get Jack to Lego camp on time. My mission: Chop all the toppings for our beans and rice dinner, cook the rice, pack snacks, feed two children, a baby, and myself lunch, nurse the baby, and get everyone into the car by 11:25. AND I DID IT. I even washed the rice pot and the stove burner which was covered in overflowed rice drippings because I am incapable of cooking a simple pot of rice it overflows EVERY TIME. Ahem. But by 11:20, I had the fed-and-nursed baby in her car seat, the diaper bag was packed, the children had been to the bathroom and were putting on their shoes. I just had to grab my keys! Where were my keys? Had anyone seen my keys? MY KEEEEEEEYS! At 11:30, I found my keys hanging from the back door. At 11:40, I got behind the slowest driver in existence. At 11:50, I got on the highway in the wrong direction. You guys, three days ago, there were TWO strollers in the back of my car. So there was a lot of awkward lugging of a baby in an infant carseat, which, thankfully, is still in use. So I guess that could have been worse, there could have been a lot of awkward lugging of a straight-up baby with nowhere to put her down at all. Lego camp finally ended and we hung around in the park until it was time to take my three small children with me to the ophthalmologist, everyone’s favorite witching-hour activity. The drive was delightful, except for how Ann Marie YELLLLLED the entire time, and I had to look at a map and also drive with my burning, itching, watering eyes while fending off questions from the 3-year-old. There may have been some other yelling, and it may have been someone yelling “I CANNOT TALK RIGHT NOW!” but I’m not naming any names. The eye doctor (I am tired of spelling “ophthalmologist”) visit was fairly uneventful. 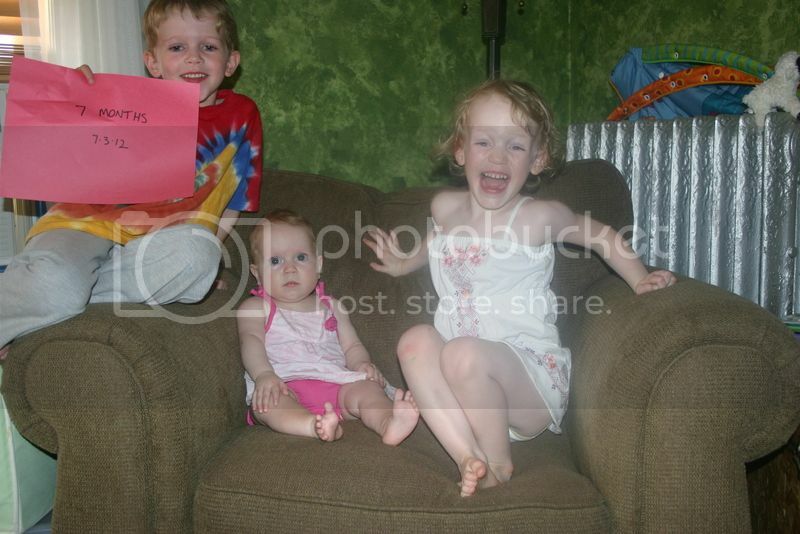 My kids were troopers, to be honest. I admit to feeling very little sympathy for the poor child who had nothing to do because I accidentally left the iPod in the car, especially given that his sisters and I had spent the afternoon waiting around for him to be done at Lego camp, but he rallied and in general they were all very well-behaved. The eye doctor diagnosed me right away with a staph infection that is not susceptible to tobramycin or erythromycin, the two antibiotics I had already tried, and he said he’d give me a new prescription for the CORRECT antibiotic. So things were looking up! But then he handed me a written prescription instead of electronically sending it to my drugstore, like all my other doctors. So now I was apparently expected to schlep myself and my three small children to the drugstore, at dinnertime, and wait around while they filled the prescription. I opted to ask the office to call it in figuring that it would be ready by the time Andrew got home and one of us could go pick it up. Unfortunately, by the time Andrew got home, I had reached my limit and fell to pieces when explaining my day. At this point, I was afraid that maybe they hadn’t even called it in yet, and that it wouldn’t be ready until after dinner which would be time to put the kids to bed, so I’d either have to do bedtime alone or drive with eyes so sore at this point I could barely open them. Sorry about that photo. I didn’t even warn you. So here’s to a cocktail of Neomycin, Polymycin B Sulfates, and Dexamethasone! Please let it work! I think there’s already some improvement, and I’m only one dose in. The moral of this story, by the way, is to just go to the eye doctor in the first place. 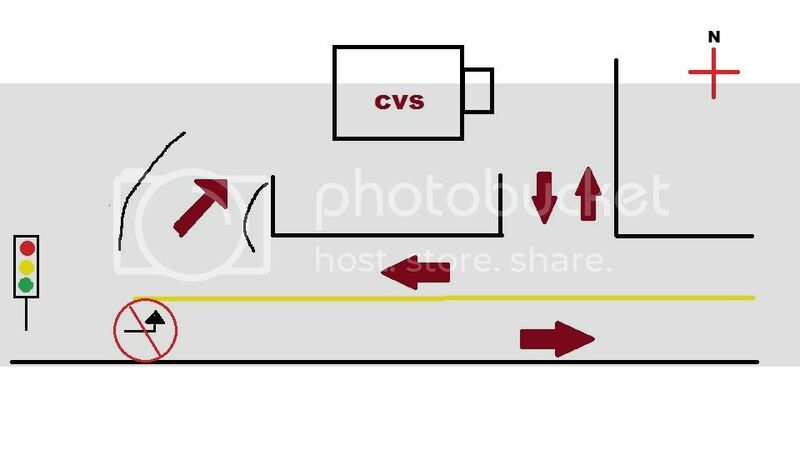 Now about that CVS parking lot: My CVS is a new one about a mile from my house. For some reason, they designed the entrances so that the west-bound traffic can enter in two places, but the east-bound traffic cannot take a left into the first entrance it comes to, you are only allowed to make a right turn there. But the west-bound traffic comes to the other entrance first, so why would anyone wait to turn into the parking lot for the second entrance? This second entrance, by the way, is one-way, so there is only one exit. This parking lot me bananas every time I drive by this CVS, and I’ve been wanting to complain about it here for a long time; now seemed as good a time as any. I’ve included a sketch to help you understand. Sometimes I think the builders were looking at the plans upside-down.